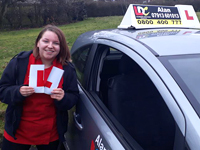 I would highly recommend Alan as a driving instructor, with working full time and having a busy schedule, Alan was always so flexible with my lessons which where all over the place. 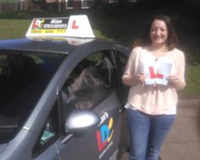 Alan was so patient with me gave me so much support with driving and and test nerves which helped me pass my test confidently. Thank you! 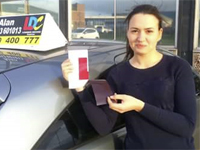 I first started learning how to drive with Alan after reading all his positive reviews and testimonials online. 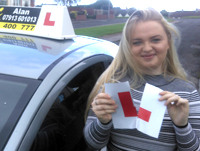 At the beginning I had very little confidence in my driving as I had never learned with a professional as had previously learned on and off with family members with no avail. My first lesson with Alan left me feeling 10x more confident than I ever had been and he really encouraged me to keep going and although it took a long time, I finally realised I wasn’t as bad as I thought I was. There was times that I felt I was performing awful during a lesson however having Alan by my side helped me remain calm and keep going. 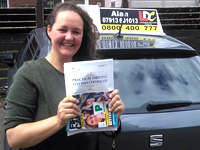 Alan has the patience of a saint and he has not only been an amazing driving instructor for me but acted in a second role as my therapist during my lessons – with no extra charge! (Sorry Alan, but thank you for all your support!!) Even during the few lessons before my practical test, he reassured me that he wouldn’t have encouraged me to book my practical if he didn’t think I was ready. 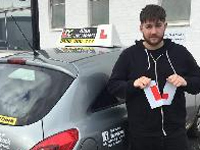 His confidence in my driving really helped me get into an “I CAN DO THIS” mindset – and I managed to pass first time :) I would recommend Alan 100%, I was lucky enough to discover him when I did and ecstatic that I listened to him and decided not to cancel my test due to nerves on test day. Thank you again Alan!!! Would highly highly recommend Alan as a driving instructor. He completely understood my time constraints due to me juggling work, uni and a placement and understood and supported the pressure my work had me under to pass my test. I felt prioritised and Alan was willing to work round me which made me feel more supported. Alan has the patience of a Saint and a calm manner which mirrored onto me. 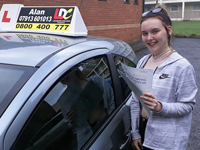 I was terrified of roundabouts before doing lessons with Alan but sailed out of the test centre roundabout with absolutely no fear!! I can't thank Alan enough! Would highly recommend Alan as an instructor. The amount of times I felt stressed out he’d make me feel a lot more calmer and more confident behind the wheel. Only took 4 attempts but finally was able to pass. He’s got the patience of a saint and doesn’t make you feel you have to stress out when driving! 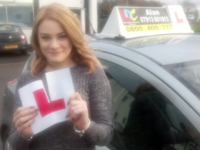 I would highly recommend Alan as a driving instructor! He is patient, calm, professional and approachable! He was happy to help with anything I wasn’t quite sure of and made me feel comfortable and confident behind the wheel. 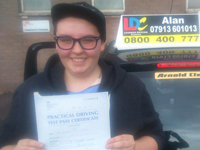 Alan gave me the push I needed to believe in myself which has resulted in me getting my licence. He has taught both my sister and I now and I wouldn’t recommend anyone else. Couldn’t recommend Alan enough!! The patience he had and the confidence he gave me was above and beyond!! If he’s got the patience for me he’s got the patience for anyone. Thanks for everything Alan!! 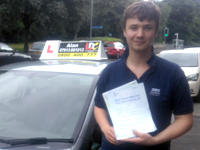 Hugely grateful to Alan for his help in passing my test. 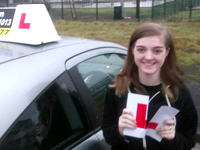 Hated driving but thanks to Alan's tuition and patience managed to just dislike it just enough to pass. Would highly recommend to anyone. Thanks again Alan. 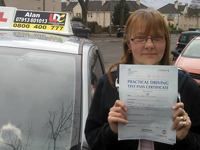 Huge thanks to Alan for all his help and patience, I couldn’t have passed first time without him. He is a great instructor and I highly recommend him! Thanks again Alan! 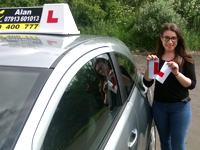 For anyone out there looking for a driving instructor Alan is a fantastic instructor who shows immeasurable patience and teaches in a way that you understand how the car works and how you are fully in control of it. 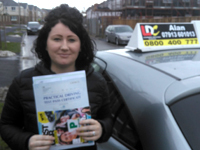 I was an extremely nervous learner but with Alan's amazing help I was able to get there. I'd highly recommend Alan to anyone. 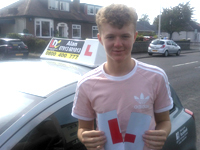 Big thank you to Alan for helping me pass my driving test, couldn’t ask for a better instructor very patient and the attention to detail to make sure every aspect is covered is second to none. 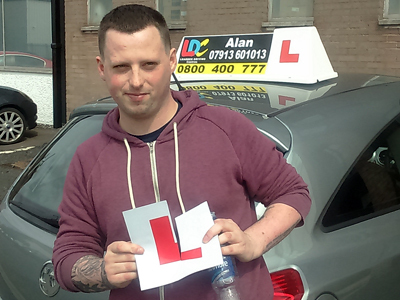 Big thank you to Alan for helping me to pass first time! 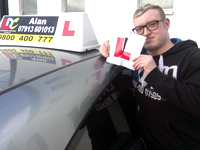 Would highly recommend Alan, he is a great instructor with patience and helped me to become more confident when driving. Thanks again! Thanks Alan for helping me pass my test. Thank you for your patience when my nerves got the better of me. Appreciate all your help. Thank you for everything you have done so I would pass. Thanks again. 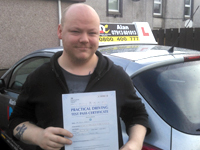 Alan is a great driving instructor, he is very patient and helpful during the lessons. 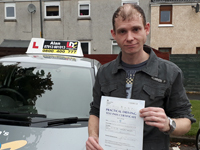 I was able to pass my test with his help and would gladly recommend him to others who are going to start learning to drive. Can't recommend enough. Alan has so much patience and great teaching style. Thank you for helping me pass in a week! 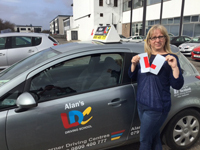 'Alan is a smart, kind and calm instructor with an excellent sense of humor. 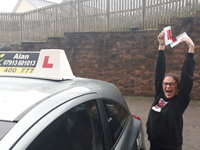 You'll spend your time learning to drive feeling supported, reassured and likely in an good conversation, easing you into becoming as competent, adaptable and confident a driver as you can be. Could not be happier; willing to bet others will agree! Brilliant Instructor! 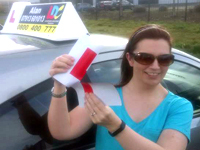 Highly recommend Alan friendly, reliable and made learning to drive an enjoyable experience. 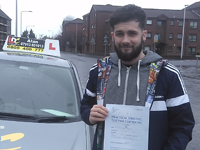 Alan is a very patient and friendly instructor helped me gain the confidence to sit and pass my driving test would highly recommend . 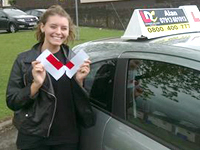 Alan is a wonderful instructor who helped me gain the confidence to sit my driving test and was able to work around me. Always gives you confidence, and always up for a laugh too. Great guy all round and i highly reccomend him. Without him i wouldn't have passed, Literally! 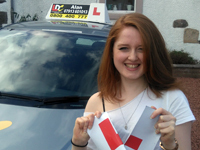 I was quite apprehensive about starting to learn to drive, but Alan's disarming approach and ability to make me feel like no question was a stupid question really set me at ease . He's got a great way of explaining things comprehensively and I cannot recommend him as an instructor enough. Thanks for everything. I came across Alan by chance and was put at ease and felt very comfortable with Alan from the get go. I had lesson 6yrs ago but wish I had Alan then. He was very patient with me and great at explaining everything. Highly recommended Alan and wouldn't of passed if it wasn't for him and all his reassurance in my abilities. Can't thank you enough. 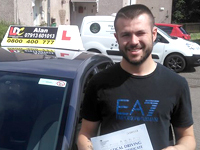 Alan is a patient and reassuring instructor who is able to give you both the skills and confidence needed to drive. His ability to highlight areas that need to be worked on and to then help you correct them is second to none. 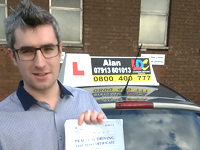 I'm very happy having passed first time and can't recommend Alan highly enough. 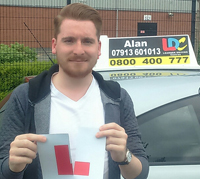 Alan was a great driving instructor, who was very patient throughout lessons which made it easier for a nervous first driver. The lessons were enjoyable, so much so that i missed them a bit when it was over. 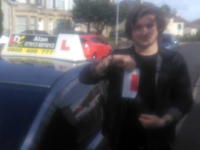 He also gave great confidence for my first independent drive after passing, and I couldn't have done it without his help. 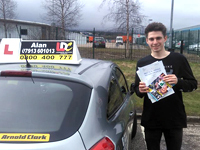 Alan is a terrific instructor, would definitely recommend him to everyone. When I first started off learning I had no confidence and was really nervous. I had 2 instructors before but I lost interest in driving for a couple of years until I decided to give it another shot. 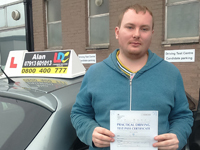 Alan gave me confidence and self belief that my driving ability was decent. Alan also made a few tweaks in my driving and made me a better driver. 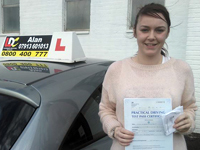 After failing a couple of tests Alan kept me believing in my self to keep myself going and that I would pass. I would like to thank Alan for his confidence in me and I know I wouldn't have passed without him. Thank you for everything Alan. Would 100% recommend to anyone wanting to learn to drive. 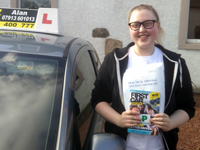 Lessons were fun and enjoyable and in a comfortable atmosphere which is what is needed when learning to drive. He only wants you to do your best. Can't thank Alan enough for teaching me! 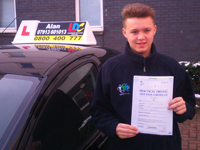 Alan was really good and always made me feel confident in my driving ever since our first lesson. Always teaching me the easy ways not like some of the other instructors I had, and I would 100% recommend Alan to everyone! Alan has a great style of teaching and made me feel really at ease - even as an absolute novice. The analogies that he used to explain things really helped me to understand the skills that I was learning. I couldn't recommend him highly enough! 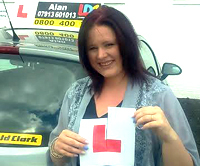 Before I started learning to drive with Alan I was a nervous wreck and had no confidence in my ability to drive at all. After several failed attempts at tests and 7 years of trying under my belt Alan made me believe I could do it. In the 6 months that Alan taught me he changed my whole thinking about driving and taught me more about driving than I had learned in the 7 years previous. He has a great teaching technique and would explain things in a way I could relate to. He has the patience of a saint and is a friendly instructor. Alan also helped me with my confidence and I am so grateful to him that I can finally say I have passed my test and that I am a good driver! Thank you so much Alan!! 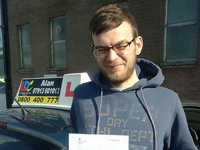 No doubt passing first time (on Friday the 13th no less) was all down to Alan. From the beginning he was patient, encouraging and knowledgeable. Always able to explain any tricky aspects of driving with a handy football analogy.... I'm sure he knows other types of analogies as well but football worked for me. In particular on the morning of my test when I was quite nervous. Alan advised me to think of approaching in the test the way Athletico Madrid play football... 'Keep the ball, keep it simple, nothing flashy and you'll get the desired result'. I certainly did! Thanks Alan! Thanks again, couldn't have done it without you. 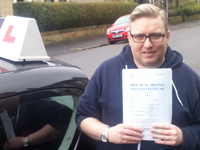 I greatly benefited from the calm and friendly instruction of Alan and would highly recommend him to anyone. I had perviously struggled with my confidence in the car resulting in a series of bad experiences over 7 years ago. 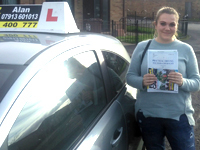 I left my first lesson with Alan feeling reassured and hopeful of passing my test. 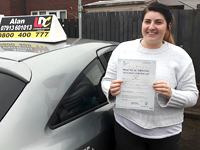 Week after week my driving improved considerably thanks to Alan's clear and professional instruction which made driving an enjoyable experience again. I consider myself very lucky for getting Alan as my first and only instructor. He is definitely the instructor to have, if you’re looking for smooth learning experience. 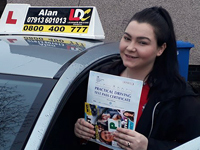 Always professional, patient, friendly and cool-headed, Alan will help you pass your test even if you lack confidence, are very nervous and have a leg nervously twitching on the pedal, like mine did. The most, I loved how he made difficult actions seem easy at the start, by dividing driving responsibilities and then gradually increasing the difficulty, until I had the full responsibility of the car and road. Another thing to add is that Alan was really easy to understand, considering that English is not my native language. 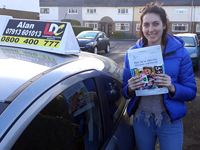 I would recommend Alan and the LDC course to everyone - you won’t regret it! 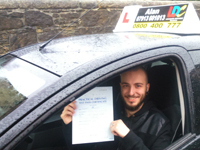 Alan was a great instructor, always kept me calm and reassured throughout out my driving. He was constantly keen on making me a better driving by pinpointing my weaknesses. 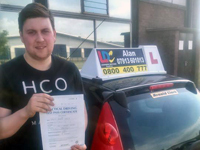 I would recommend Alan to anyone wanting to pass their driving test! Alan was very patient and explained everything well. I found him very good and would highly recommend him to anyone looking to get through their test. 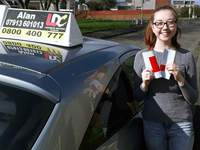 Allie Girvan (Mum) - Big thank you to Alan for getting Rhiannan through her test and giving her confidence and enthusiasm a much needed boost. I highly recommend Alan. I enjoyed all of my lessons and was always learning to my pace with a great instructor. Ffelt welcome from the first lesson and it was always a good environment to learn in, and am now looking forward to many years of driving thanks to Alan. 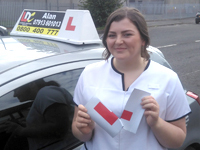 Learning to drive with Alan was a very positive experience. All lessons are forward planned to enhance development, Alan is approachable and no question is too silly to ask. 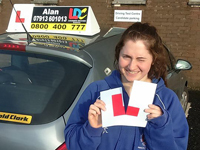 I would highly recommend learning to drive with Alan, his calm and relaxed attitude can encourage even the most nervous person. I can't thank him enough for helping me pass my driving test. Incredible driving experience with Alan. So friendly and encouraging from the get go. 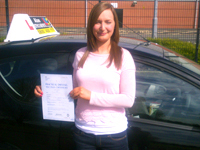 I was instantly made to feel very comfortable & confident in my driving. He taught me all the skills required to make me a good driver & enabled me to pass my test first time. Would recommend him 110 percent! Alan has a calm and reassuring manner during lessons that helps install confidence. His approach is structured and tailored to the individual strengths and weaknesses of the driver, allowing simple pointers, methods and techniques progress development at a steady and suitable rate. 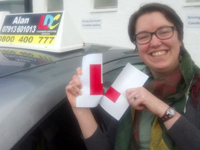 He always offers encouragement and positive feedback when necessary, and his advice for improving and maintaining aspects of driving was absolutely critical to me passing first time with very few minor errors. 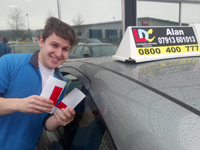 He is a natural teacher, and if you want to pass your test with the help of a safe and assured pair of hands, you can do no better than Alan. Highly recommend! 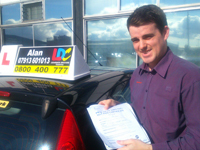 Alan teaches to drive in a calm and friendly manner. He carefully plans each lesson to provide a smooth learning progression which shapes the skills needed in order to pass a test. 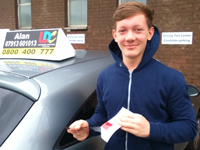 He offers great feedback and advice on how to improve one's driving. He also does what's best for the pupil and their safety. Highly recommended. 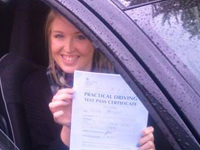 Just passed my driving test first time thanks to Alan. Great Instructor only needed 17 hrs of lessons. 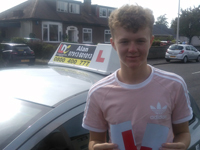 I would highly recommend him made me feel as ease and his teaching methods and encouragement led to a first time pass with only 5 minors. Thanks.